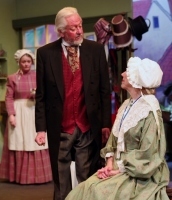 An antidote to loud and brash pantomimes, the play Cranford at Christmas tells a quiet, pensive Victorian tale about the kind of Christmas we all yearn for. 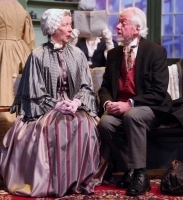 We left the production at the ADC Theatre in Cambridge Tuesday with a contended sigh. 'Let's just go and live inCrandford, shall we?' my friend said as we left. 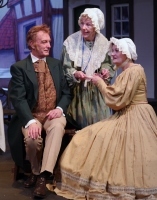 It is the cosiest of evenings describing the goings on in a 19th century northern England community courtesy of the talented Combined Actors of Cambridge and based on the beautiful and gossipy novel, Cranford, by Elizabeth Gaskell. Beautifully acted and elegantly directed with plenty of laughs and a few surprises, the play by Laura Turner is the perfect build up to Christmas, complete with a heart-warming reunion, and a wonderful joyous party with traditional carols on Christmas Eve at the end. The novel tells the stories of a small country town and revolves around the lives of the women in the village and this play takes all of the well loved characters therein and shows us how a Christmas here may pan out. From the start, we could see that this was a very able company of actors under the direction of Gloria Milne. The main action (if action is the right word for such a genteel plot) takes place in Miss Matty Jenkyns' (Brenda Cottis) tea shop where the local women appear to gather to put the world to (19th century style) rights. Mandi Cattell is absolutely outstanding as Miss Pole, whose gossipy ways have made her the village know-it-all and whose hilarious one liners throughout are delivered with just the right amount of shock and horror at some of the goings on of the other villagers. We can't help but feel she really would like to do some of the things her neighbours may get up to and that actually she has a heart of gold. The plot tells of a terrible incident at the village hall when, due to 'an infestation', the Christmas party which was to be held there must instead be held at the tea shop, sending the ladies into a veritable spin. 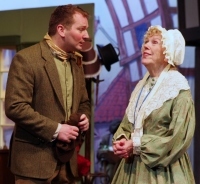 Martha the live-in maid (Izzy Rees) and her husband Jem (James Inman) are hiding a secret too; Martha is expecting a baby and they are afraid of letting the lovely Miss Matty know in case she throws them out. So very 19th century! There are so many excellent performances in this production: Mrs Jamieson, the local 'gentlelady', travelling everywhere by sedan with her dog Precious Flo (the cutest doggy actor I have ever seen). She clearly likes to believe she is a cut above the others. There is also a far too brief very, very funny appearance by Caroline Lewis as Mrs Forrester, a portly deaf lady with a large cat whose cherry brandy has the women in the teashop most flummoxed. 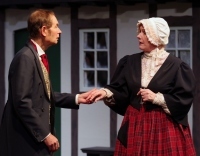 Mary Smith (Caroline Harbord), friend and employee of Miss Matty, is performed with panache and flair. The gentlemen of the cast didn't disappoint either: Poor Thomas, the handy man whose sweetmeat mince pies caused a stir and who did some bad things for some very good reasons, was touching and just simple minded enough; and Mike Milne as the dashing village Dr Hoggins, who stole away the heart of Lady Glenmire (Mandy Jeffrey), sister-in-law of Mrs Jamieson. With so many characters in this play, intially I thought it would all be too confusing, but it all fell into place very quickly. Of course, in such a lovely piece a beautiful Christmas message emerges about family and friends being together at Christmas. Dear Miss Matty's brother Peter (Graham Waterhouse), who she believed dead in battle reappears, intially in disguise (bear with me here...) but eventually, via the medium of marmalade, revealing himself, and all ended wonderfully with a joyous party and traditional carols on Christmas Eve. Credit must go to the group of carol singers who appeared sporadically and sang beautifully, and to the other performers, including random villagers wandering around the stage in the background, and James Dowson, as the dashing Major Adams, and the downtrodden Thomas, Lindsey MacAuley as Betty the maid, who quite clearly had a bit of thing for Mr Mulliner (James Inman again) and whose fainting scene was really rather spectacularly done. The set was lovely and very well arranged. I had forgotten quite how beautiful and small the ADC Theatre is. A very gentrified audience and atmosphere made the evening even more special. 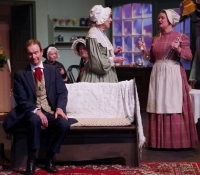 Based on the Cranford stories by Elizabeth Gaskell, Laura Turner's play reflects life amongst a community in a small country town in Cheshire in the early 19th century. A fantastic set designed by Tony Broscomb greeted the audience as they entered the auditorium of the ADC Theatre. The stage consisted of two period houses set left with Miss Jenkyns' tea shop interior, complete with an authentic looking window and door stage right. All the props and furnishings were appropriate although I did feel that everything felt a little cramped in the shop when there were several people in it. All of the scenes were well lit and the carol singers, who appeared at regular intervals throughout certainly helped to enhance the Christmas feel of the show. The costumes, hair and make-up were all good and in keeping with the period, although I did wonder about the black coat worn by the thief it seemed to me a little out of step with everything else. But then again, I'm no fashion icon. The play does not really call for any Oscar winning performances, but there were good portrayals of all the main characters, ably assisted by the smaller roles, with a few non-speaking characters thrown in to create some background activity. The by now compulsory dog role was fulfilled by Flo who was woof perfect throughout. She even had a spectacular sedan chair entrance, accompanied by the suitable snooty Mrs Jamieson (Rosemary Eason). I particularly enjoyed seeing Caroline Lewis as the slightly strange Mrs Forrester who made the most of her scene. Lindsey McAuley who, although on stage a lot had few lines but was impressively back acting throughout. For me the star of the show was Mandi Cattell as Miss Pole. She did not waste a single opportunity and most of the laughs came as a result of her delivery of the lines. Indeed, the company as a whole made the most of a script which I felt was a little lacking in places. I felt that the sub plots of the thief and the presumed dead brother were slightly lost amongst everything else. If the first night was anything to go by there was no chance of the snowman set downstage left melting during the run in a decidedly cold ADC theatre. However this was a good production of a gentle, nostalgic play performed by anextremely competent cast. Congratulations tgo Gloria Milne in bringing a seasonal delight to the stage.